Start 2019 off right with the first paddling event of the year. 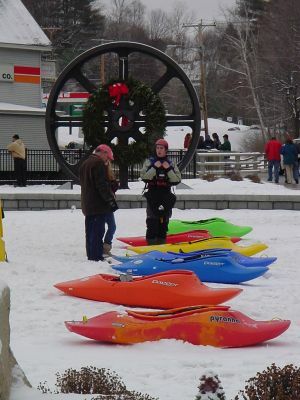 New Years day on the Winnipesaukee River in NH has been an MVP tradition for decades. This year marks the 38th annual run. We will NOT be in the church this year. We are using a large meeting space down the street from the takeout. It's at 361 Central Street (across from Marty's shop), on the SECOND FLOOR above TOAD HALL. There is public parking behind the building. It's a large comfortable space plus plenty of small rooms for changing, etc.It will be open shortly after 9am. The take-out tent is sponsored by the fine folks from Choose Franklin. More info on the Franklin, NH city web site. 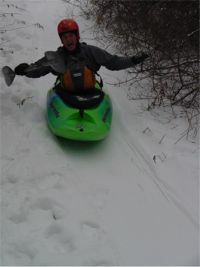 The one and only MVP New Years Day Icicle run (aka , the Hell on New Years Hangover kayaking event) on the Winni in Franklin and Tilton. We are working on obtaining the Unitarian church for a place to warm up and change clothing. Expect we'll have the building from 9 to 3. The last hour we will need to clean up and clear out. We are planning on executive chef ( Nancy) providing stuff shells and all the fixin's ( subject ot chefs whim to change to something else) . Planning on about 50 people. BYOB for beer/wine etc and we welcome something to share (Lynns jello shots come fondly to mind, but cakes, brownies, cookies etc are nice too). Last year we did a dry/canned food drive to help the local food pantry. We would like to do this again this year, with the donations going to help the local soup kitchen. 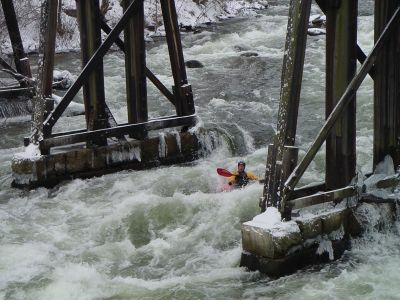 There are two river sections that will be paddled on New Years Day. The traditional Northfield to Franklin run (class III) starts on Cross Mill Rd. in Northfield. This river segment is about 1-1/4 mile long and will take about 30 to 45 minutes to run. 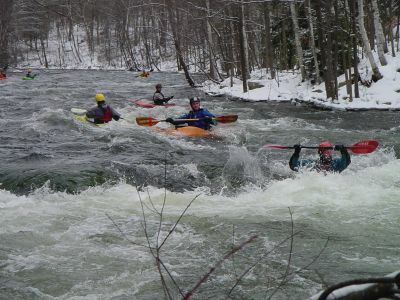 For description and directions go to the American Whitewater website at: Lower Winni Webpage. In 2009 the average run time was under 15 minutes, and due to the weather, thawing time at the church took longer to get out of our ice enclosed clothing than the run took, but everyone who came had fun, especially the crew that did multiple runs. Please note these are not official trips they are only notification of paddlers meeting locations and times in order to make paddlers aware of a meeting and launch point of “common adventurers”. 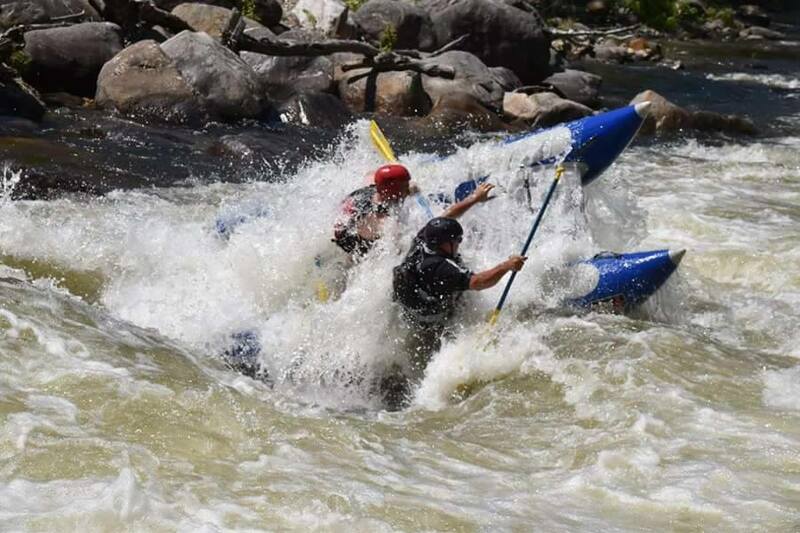 Each paddler is responsible for his or herself being properly equipped for the conditions to be encountered that day. That means PFD’s, wet suits, dry suits, gloves, helmets, booties, etc. Furthermore, each individual is responsible for their own safety, you should have the skills and physical conditioning to be able to perform or assist in self rescue and not put your fellow paddler in danger by being irresponsible. Non Boaters and boaters from other clubs are welcome. We are asking for a few volunteers to help shuttle, help out in the kitchen and clean up afterwards. 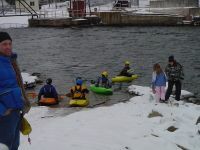 This year the we will continue to press for the Winnipesaukee Recreational plan. The New Hampshire Department of Environmental Services is in the process of creating a Lake / River management plan that will affect flows on the river. This is a prime opportunity to get our voices heard on this matter. We will get front page news coverage on this, better than sending hundreds of letters to the legislators. Please show up and support us on this, a huge turn out will be bigger news! !